A lot of the conversation over there is about decorating or transitioning into winter after Christmas. I have been asked if I leave up some of my Christmas decor for winter. I have done that in the past and it always feels too Christmasy, so I end up putting it all away. Last year I even put a reminder in my phone that says "commit to putting away ALL the Christmas decor at once." Alas (who actually says alas? ), I still have some Christmas decor up, and I admit it does still look too Christmasy. Once the trees are down it won't, but I'm not ready yet. I enjoy the warm glow of the lights on cold blustery nights. What I did do is put away everything that was red. I really needed some white space after the holidays, and I love quieting the house and getting back to whites and neutrals. Woah, that seems like a lot! Anyway, here are some ways I decorate the tv room for our cold, snowy winters here in New England. I covered two large framed photos with birchbark wrapping paper. For Christmas, there were wreaths on them with lanterns in the middle. I removed the wreaths and left the birch paper and lanterns. I like the look, but the lanterns are too small without the wreaths so I am in search of some larger lanterns and hooks. As you can see, the Christmas tree is still there. This is a faux tree we ordered from Target. We chose it for the sparse, natural look for a few reasons. 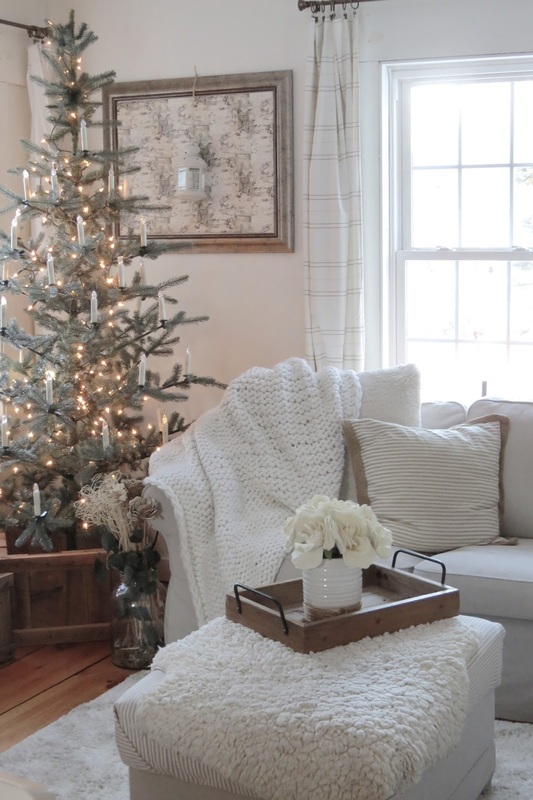 The tree is in front of a window, and we like to allow as much light to filter through as possible, the room is very small and a full tree feels overpowering in here, we can see the ornaments better from a tree like this, and we like the Scandinavian look of this tree. We went faux this year because last year we had a spider situation with our live tree. For Christmas this is decorated with mostly red ornaments. Once I took the ornaments off, I really liked the bare, lighted tree so opted to keep it up until we grow tired having it there. We found these clip-on candle lights at walmart.com and just love them. The batteries lasted all season and have just died in the last few days. The problem is getting the old batteries out which is like pulling teeth! My husband made the tree crate from scraps of wood. We also add many layers of faux fur and sheepskin pillows and blankets, as well as sweater pillows and chunky knit blankets. Fur trim, pom poms and faux sheepskins add to the cozy winter feel. 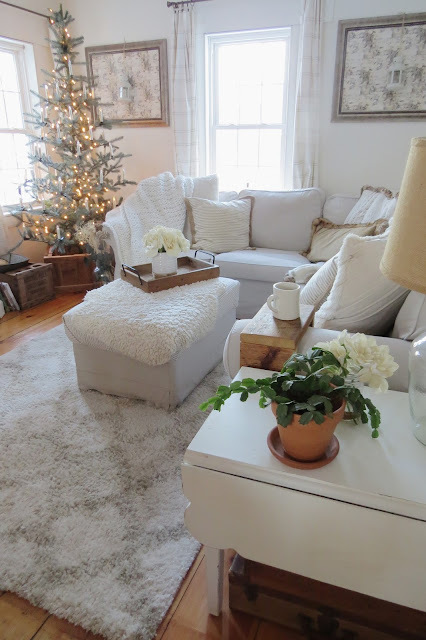 I hope you enjoyed a look at our tv/family room for winter. This week I will be sharing another room transitioned over to winter. I hope you will stop by! 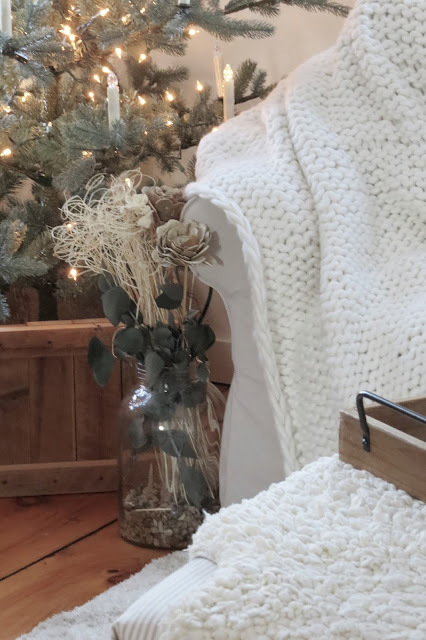 This is lovely--white with natural accents feels so right at this time of year. I've peeked at your blog periodically. Love how you have transitioned through the past years from country classic to a much updated look of so much white. Your home is charming and warm. 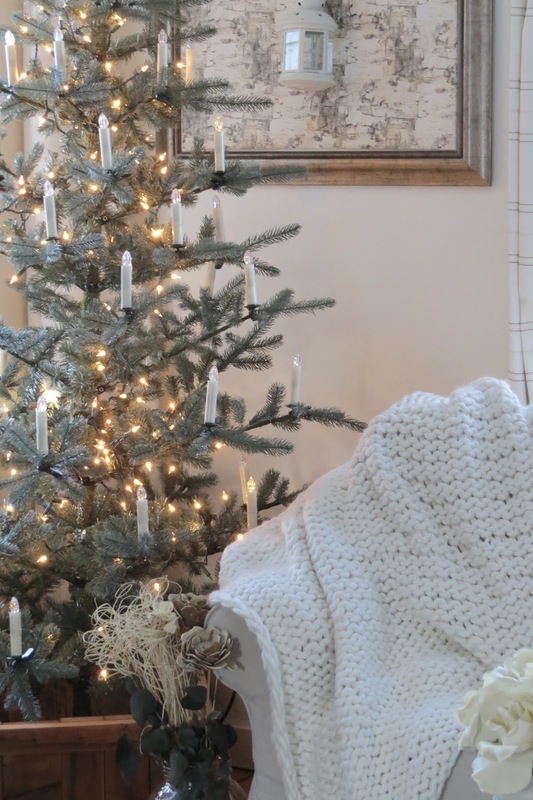 Love faux tree you found, it has that more Scandinavian look I love too. In the 80's I had the candlestick lights for my tree as well. It gave it that Williamsburg look. I am eager to take down Christmas as well, but usually wait until after the Epiphany. Best wishes for a prosperous 2018. Thank you so much for your kind comments! I am posting a lot more on Instagram these days - I would love to have you find me there! I literally was looking around my in box last week to see if possibly I had missed a Christmas post from you..... was so glad to see you in the "InBox" this morning !! :) ... I don't have an instagram account ... perhaps I need to change that ... lolol.. Love that you left some Christmas / winter up!! My tree is still up and I am so enjoying it in the evenings and early mornings.... even though I know I need to say goodbye... Not yet!! I love that tree from Target!! Happy 2018 !! This is such an encouraging comment Lisa! I really need to make the time to post more often here. Instagram is just so much quicker and easier. I hope you get one! I am so glad you found me too Cathy! Moving to a new (to you) home is so exciting. There are just so many possibilities. My best advice for a small home is not to fill it with too much stuff. Less is more. Buy only what you love and take your time with your choices. I like to find functional things that I love the look of. I hope you create a home you love!